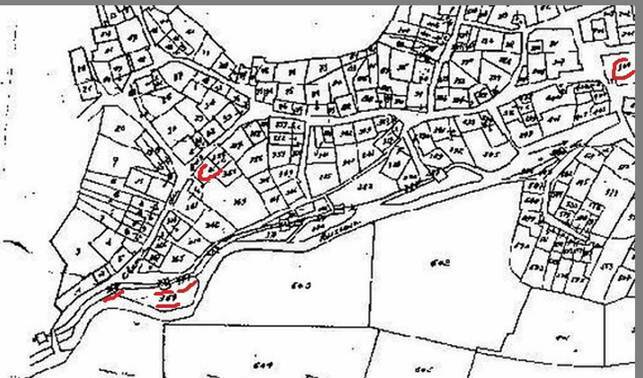 On a map of properties in Osse in 1837 we have the original house and associated properties listed as belonging to Pierre Casamayou, Instructeur, Osse (Instructor, Osse). Below, it is explained in the text and genealogical chart that this Pierre was a Latourrette-Casamayou (1784-1861), a direct descendant of David Latourrette. He represents the transition of the surname from Latourrette to Casamayou, based on the customs of Béarn where historically families took the name of the house in which they lived. So David de Latourrette and his son Jean de Latourrette were from the house of Latourrette. Later, we find the children of Pierre Latourrette-Casamayou identified as Casamayou, being members of the house of Casamayou. 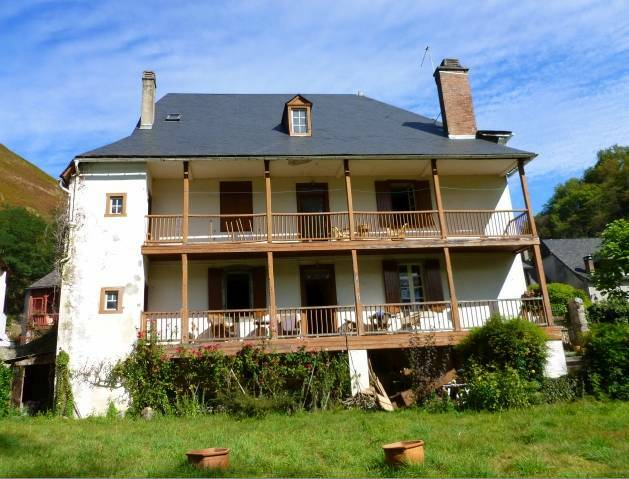 Four other properties are listed (#368, #369, #370 and #371) belonging to Pierre Casamayou (Pierre Latourrette-Casamayou) which represent the Latourrette mill and millraces off of Larricq creek. The mill is shown as #370 with the headrace #368 and trail race #371. The number #369 represents property surrounding the mill providing access to it. (These four properties are underlined in Red on the Osse Map, 1837. The Latourrette-Pon house is directly across the street at #5.) Of the six mills shown on the 1837 map of Osse only one remains as a historic remnant (not operating) downstream from the where Latourrette mill was located. It is well known that the Latourrette family operated a grain mill in Osse, but exactly when the mill shown on the 1837 map was first established is unknown. In another section of this webpage it is demonstrated that the Béarnais surname of Gassioo de La Torreta, the minister who established Protestantism in Osse in 1563, meant miller. Before water powered mills were built, round stones (tours in Béarnais) were used in the fields to grind the grain. It is, therefore possible that Latourrette in French, derived from La Torreta, first described a miller working in fields with grindstones and then later, after the use of water power was introduced for grinding, we find a Latourrette mill on the Larricq. See section Likely Origin of Latourrette Surname in Béarn on this webpage. As a footnote, Madame Laurence Guay, the current owner of the Latourrette house, identified below, indicates there is considerable evidence of the ownership and operation of the mill among the items she acquired with the purchase of the house in 2011. The original house dates back before 1569 when the village was burned on October 22 of that year, after Huguenot armies loyal to Jeanne III d’Albret, the Protestant Queen of Lower Navarre and Béarn, drove out the invading forces of the Catholic King of France. Baron d’Arros came to the Aspe Valley to burn and pillage Catholic properties. The dime and abbey of Sarrance, about 5 miles north of Osse, was granted to the village of Borce which was loyal to the Queen. It is said that Osse was burned as the result of the martyrdom of Miramonde Loustau who was tortured and killed during the occupation of Béarn by the Catholic army. Miramonde Loustau was the wife of Pierre d' Apoey of Osse and related to the minister Pierre Loustau of Lembeye tortured and martyred at Lescar, with two other ministers, in April 1569. The burning of Osse, along with other villages was in response to the suppression of Protestants by the Catholic army, joined by some of the Catholic villagers. The villages of Borce and Lescun were spared because Bernard Salefranque of Borce, abbot of Borce and Lescun was loyal to Queen d'Albret. After 1569, Osse became strictly Protestant and took control of the Catholic Church St. Etienne until 1620, when Bearn was joined to France by force and Béarn was forced to be a Catholic state under the King of France. From stories passed down in Osse, it appears the Latourrette house was burned with the rest of the village on October 22, 1569. Madame Gilberte Gaubil, a local historian and expert on the Béarnais language, customs and history, indicates the houses at that time were not of the stone structures one finds today in Osse but wood and other readily combustible materials. It is alleged that after the fire only the west section of the Latourrette house, a large stone chimney structure, remained intact. This section of the house is still evident today from a much earlier period behind today’s structure which dates from a major reconstruction of the house in the 1870s by Antoine Casamayou (Antoine Latourrette-Casamayou), described below. As one might assume the chimney structure on the southwest corner, behind the extensively rebuilt Latourrette (now Mayéyrau) house, was a small tower,* the author consulted with Madame Gaubil about its origin and construction. At its base the structure is about 7 feet square and there is a large open area underneath where the hearth was located. After viewing the structure, Madame Gaubil indicated major houses in the Aspe Valley had large baking areas attached or close by with chimneys. She said it would not be unusual for one to be able to walk into the base, appreciate its large size and see the interior stone black from heat and fire over the years. She also explains that these structures did not have substantial foundations and, therefore, were very large at the base, constructed of stones laid directly on a cleared ground surface. She said there is a good example close to her house in Aydius, a small village east of Bedous in the mountains. Joe LaTourette from America, visiting Osse in 2012, referred to the structure as a tower, hence the need to clearly identify its origin and construction. In terms of Madame Gaubil’s reference to chimneys associated with major houses in the Aspe valley in which Osse is located, note that the meaning of Casamayou itself is "large house." Mayérau House in 2012, with extensive work required on south face. Structure on left is the cut off chimney capped by a roof from the reconstruction of the 1870s. Source: Photo Courtesy of Joe LaTourette from 2012 visit. Maison Mayérau was purchased in 2011 by Madame Laurence Guay, whose parents also own a vacation house in the village which they visit from Pau. In terms of learning more about the house, it is fortunate that Madame Guay speaks and can communicate by e-mail in English. Joe LaTourette, who visited Osse in 2012 with his wife Kathy, describes Madame Guay as an antique dealer and history buff with a household of antiques, including articles and pictures from the time the house was occupied by the Latourrette and Casamayou family. These items include framed portraits of the second Antoine Casamayou and Louis Mayérau. In addition to items of furniture there is a safe with A. Casamayou and Osse engraved on the front. From Joe’s description and my correspondence with her, it is obvious Madame Guay is very interested in the history of the house and its prior occupants. She also has launched an extensive project of much needed repair and maintenance of the structure, with the assistance of Gerald Burs, who is a contractor living in the village. (Her interest in the history of the house and commitment to its preservation will likely yield more information about its history over time. )Prior to coming to Osse, Madame Guay was involved in operating a restaurant in Paris called La Petite Tour. The text here is complemented by the genealogical chart found at the end of this section. It highlights the people who controlled the house and how it was occupied between David Latourette (1625-1697) and Antoine Latourrette-Casamayou (1819-1886), who ultimately is referred to as just Antoine Casamayou. More complete information is given in the chart about births, marriages and deaths. The Mayérau house in which Madame Laurence Guay lives today is the original Latourrette house of David Latourrette (1625-1697) which passed to the Casamayou family (sometimes written in church records as Casamayor or Casamajor) and then back, in a sense, to Pierre Latourrette who married his cousin Catherine Casamayou in 1744. However, with Catherine bringing the property to the marriage, the house could have carried the Casamayou name, which was the basis later for the transition of the surname of the family from Latourrette to Latourrette-Casamayou and then to Casamayou. The genealogical lineage of the Latourrette- Casamayou family which shows the transition of the name of the house and its impact on the surname used by the family, going from Latourrette to Casamayou over several generations, follows this narrative. The existing Mayérau house was likely known as the Latourrette house during the lives of David Latourrette in the 1600s and his first son Jacob Latourette which extended into the early 1700s. It could have been known as the Latourrette-Casamayou house for awhile, but certainly just as Casamayou sometime after 1774 when Catherine Casamayou died. Catherine was predeceased by her husband Pierre in 1770 and maintained possession of the house, which was then inherited with her death in 1774 by her son Antoine Latourrette (1745-1813). When the last male, Antoine’s grandson named in honor of him, Antoine Latourrette-Casamayou died 13 March 1886, it passed to his sister Rose who was married to Louis Mayérau. Rose died two months later on 9 June 1886 and the house was inherited by her husband Louis Mayérau. In Osse, usually the name of the house follows the inheritance. The passenger list for the second Antoine when he arrived in San Francisco in 1851, on his way to Vancouver to make his fortune, however, has him as A. Latourette. But on the large family tomb in Osse, he is Antoine Casamayou (18 December 1819-13 March 1886). It is obvious that during this transition of the name of the house, the family decided to use Casamayou as the surname. So Antoine became Antoine Casamayou following the ownership of Catherine Casamayou after the death of her husband Pierre in 1770. (In fact, on the 1837 map of Osse, cited above, the property is listed as belonging to Pierre Casamayou, Instructor. This Pierre was Antoine's father, but he is listed on the tomb in the Osse cemetery-- west wall- as Pierre Latourrette-Casamayou, 12 April 1784-18 December 1861. Another Béarnais custom should be mentioned here. With the marriage of Pierre Latourrette to his cousin Catherine Casamayou in 1744, children of that marriage could be referred to as Latourrette-Casamayou. The first surname refers to the father and the second to the mother. This why we find during the transition of the name of the house from Latourrette to Casamayou, some of the children or grandchildren referred to as Latourrette-Casamayou. This explains why the name of Pierre Latourette-Casamayou (12 April 1784-18 April 1861) appears on the family tomb, although as noted above he is Pierre Casamayou on the property map of Osse in 1837. Here I quote from Joe LaTourette’s e-mail to this author relative to his visit in 2012 with Madame Guay about the reconstruction of the house in the 1870s. Madame Guay "does not have much --- historical information about the house until about 1825-1830, when Antoine Latourette Casamayou left his parents’ home to seek his fortune in Spain and eventually North America. Antoine was the second son * in his family and, by custom, would not inherit his father’s estate. So he left at age 16 to make his own way in the world. He first went to Cadiz, Spain, then to Mexico and then to California, probably around the time of the 1849 gold rush. ** Antoine eventually made his way to Victoria and Vancouver, British Columbia. He was in the import-export business in Canada and served for a time as the French Consul in Vancouver. 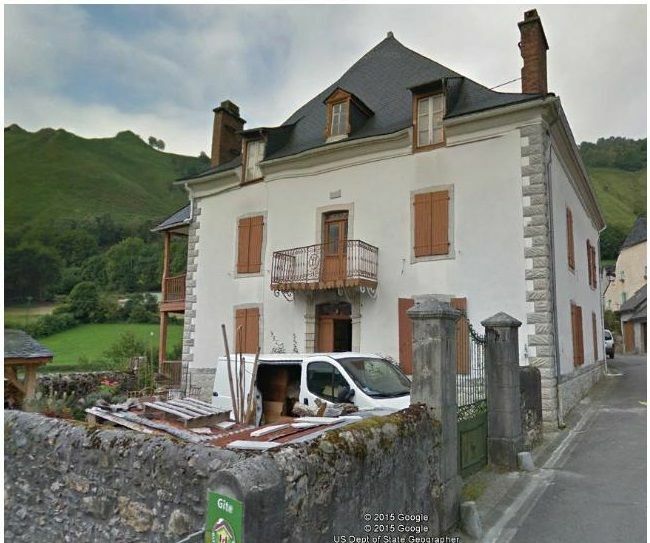 In about 1870 he returned to the Aspe Valley and began to remodel and expand the old home in Osse, perhaps with his nephew, Jean Baptiste Casamayou, since Antoine never had children of his own." Interesting information from Yves Lafournere about the second Antoine Casamayou indicates he was the Mayor of Osse after he returned from Canada. * A substantial proportion of the genealogical lineage presented at the end of this section was researched and posted by Yves Lafournere, who is related to the Latourette family of Osse. In correspondence with the author, Lafournere indicated the only offspring of Pierre Latourrette-Casamayou and his spouse Marie Labourdive, he could identify were Antoine (1819-1886), Rose (1814-1886) and Marcelle (1817-1884). If there was an older son, he perhaps died before 1770 when Antoine returned to Osse from Canada. ** As noted above, the passenger list dates Antoine Casamayou’s arrival in San Francisco in 1851. Another significant point about the house is that there are graves under the house because, after the Revocation of the Edict of Nantes in 1685, Protestants, who refused to convert, were refused burial in the village cemetery and had to be buried under barns or houses. We think the graves include David (1625-1697) and his spouse referred to in church and official documents as both Magdelaine and Marguerite (1630-1705). In other sections of this webpage, the lives of the Latourrette family in Osse have been described from the minister Gassiot Latourrette (1540-1595) to David Latourrette (1625-1697) to Jacob Latourrette (1650-after 1716), Jean Latourrette’s older brother. From the 16th to the 19th century, the family was the most prominent in Osse. The genealogical chart that follows traces the primary lineage from Jacob to the second Antoine, who reconstructed the house in the 1870s. Jacob was an "avocat" – a lawyer, who appeared before the Kings Court in Pau, called the Parliament of Navarre. He is known for his defense of Protestants at the King’s Court in the late 1600s and early 1700s. Another prominent, post 1685, member of the family was the first Antoine Latourrette, noted above. It appears that Antoine established the Catholic branch of the family by adjuring after his mother's (Catherine Casamayou) death in 1774. It is possible that a Catholic Bishop who was very aggressive towards Protestants may have forced the adjuration to secure his inheritance, but it also appears his marriage was to a Catholic. Antoine is known as a very tolerant man, respected by both Protestants and Catholics. He was the Premier Jurat at Osse who on December 1, 1788 recognized the marriages of 59 Protestants who had been previously married secretly by Protestant ministers during the Desert period. This action, which also legalized the children of the marriages, was based on the Edict of Tolerance of November of 1787, effective January 1, 1788. (The Edict applied only to Calvinists, not Lutherans.) See Andre Eygun,Peuple d'Aspe, 1989, p. 65.
and correspondence with Yves Lafournere. Author checked the birth, baptism, marriage and death information by reference to the entries in Catholic Church of Osse on-line at the Pau archive. The birth and death dates for Pierre Latourrette-Casamayou, Antoine (Latourrette) Casamayou, Rose (Latourette) Casamayou, and Louis Mayérau also are confirmed by the family tomb in Osse.